I saw a bunch of toys at Hasbro's Toy Fair 2011 showcase today. These are some of the highlights. Not all of these are great toys, but most are delightfully odd. 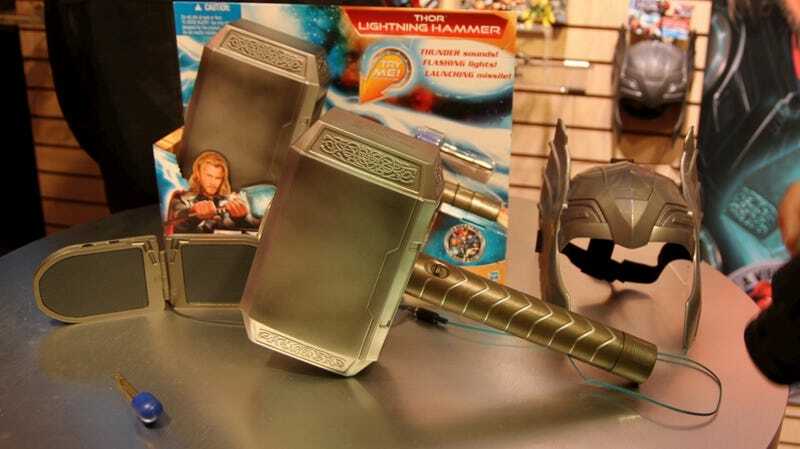 There are a lot of toys being made for the upcoming Thor movie, including a replica of Thor's hammer Mjolnir. It shots the blue bolt you can see in the lower left. This hammer is guaranteed to be more fun than all the Captain America shield toys they're making. This is a Millennium Falcon that's part of Hasbro's Playskool line. It's the most adorable ship that ever flew the Kessel Run. For some reason, there is a Darth Vader that can transform into a Star Destroyer. Did you demand it? I know that I didn't. This Death Star case holds retro Revenge of the Jedi figures, plus two tiny bonus figures. This one is a Comic-Con exclusive and a callback to the original title of the third Star Wars movie, Return of the Jedi. The other side of the Death Star case shown in the previous image. Roll a vehicle into this Transformers Play-Doh set, and a robot comes out the other side. Brilliant! Jigazo is a strange one. It's a jigsaw puzzle of sorts. Every piece is coded and sepia-toned. The Jigazo user takes a photo and plugs it into Jigazo software on their computer. They press some buttons and print out a grid that is full of the symbols for the Jigazo pieces. Using that coded grid, you can piece together a portrait that, when you stand back from it, will look like a sepia-toned version of whatever photo you started with. A new NERF gun with a large ammo clip. Threatening! The NERF tactical vest, for those moments when you want to get serious about NERF combat. Muhammad Ali Monopoly exists, for some reason. Just for Kotaku readers, a look at a new My Little Pony. You're welcome! A bunch of new retro GI Joes. A bunch of even more retro GI Joes, plus the signature GI Joe plane, the Skystriker. Not pictured: The version painted to look like the Transformer Starscream. That one, a Comic-Con exclusive, features a Cobra Commander figure as the pilot and an old-school version of Transformer Megatron as Cobra Commander's scoped and stocked gun.